BFBC2 Mod Loader allows you to install your client & server side mods easy & fast without modifying or replacing original game files. To make this possible I modified one tiny file (package.mft) of the game that specifies the fbrb. archives which are to be loaded by the game. With BFBC2 Mod Loader installed the game loads one additional fbrb. archive which is located in BFBC2 Root\package\levels\mods_common. My tool manages this archive and installs mods to it. Works with Singleplayer, Multiplayer & Vietnam Add-On! New: BFBC2 Mod Loader has an UI for managing your mods now! -UI for managing your mods (enable/disable and delete single mods, change load order etc.) NEW! Note: Only mods which would normally go into level.fbrb, terrain.fbrb, loader.fbrb, ingame.fbrb, startup.fbrb and mainmenu.fbrb are tested and confirmed as working for now! To support more archives is not planned at the moment, but feel free to tell me which archive is important for your mod to work. 1. Make sure to only include the necessary files for the mod to work (.dbx, .itexture etc.). Always remove .xml files after editing them for example. 2. Create a folder and place your files in it. Directory should look like CreatedFolder\Animations\Test.dbx or/and CreatedFolder\Objects\Test.dbx etc. 3. Create a folder called "ReadMe" or "_ReadMe" (not case sensitive) in your created folder and place all files which are not directly related to the mod in it. 4. Download the Description.ini template, fill it with the required information and place it in the root directory of your created folder (ModType is important!*). Do NOT place anything else in the root directory of your created folder or it could conflict with the game or other mods! 6. Give the zip a name and that's it! *Mod/archive types: level, terrain, loader, ingame, startup, mainmenu, modpack, map. Note: BFBC2 Mod Loader also supports modpacks and maps now! Download the "Mod and Description.ini Templates" to see how to create compatible modpacks and maps, it's a bit different than standard mods. Better instructions will follow soon™! If you find a bug or the tool does not start at all please don't hesitate to report it to me! Not compatible with mods that are modifying "package.mft", but they can be made compatible by either modifying the "package.mft" or by repacking the mod like described in the section "For Modders" above (only client mods!). I may add a tutorial soon. *Does not require BFBC2 Mod Loader & can't be installed with it. Needs manual installation. *²Needs manual modifying of files to be compatible, see section "Compatibility" above. 2. Execute "BFBC2 Mod Loader.exe" and click "Install Mod" to install a compatible mod. Note: If you have both client & server you also need to install the tool for both. To avoid confusion, I recommend to create a shortcut for both exe files and rename them to "BFBC2 Mod Loader Client" & "BFBC2 Mod Loader Server" for example. Only install client mods to client and server mods to server or it will cause issues and mess up your mod archive! Tip: The title of my tool tells you if it is in client or server mode, so you always know which exe file you opened. -Feel free to share pictures or videos about my tools, but credits would be nice. -Do NOT include my tools or parts of it in your mods, you need to link my tool if it is required for your mod! -Do NOT (re)share my tools on Nexus Mods or other sites! -Do NOT sell my tools or parts of it! -Frankelstner﻿ for his Python script which packs the .fbrb archive. 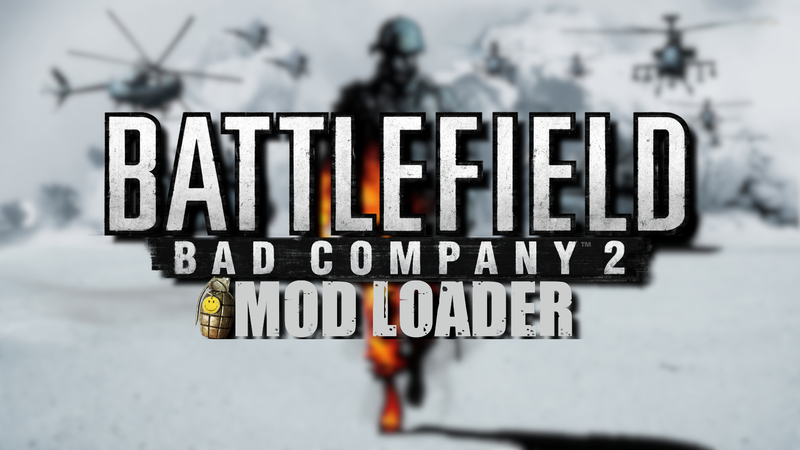 Without his work in the BF Community "BFBC2 Mod Loader" would not be possible! -Napisal﻿ & bad .baubau﻿ for all the time they invested to figure out how Frostbite works. Without them I would not even know about BFBC2 modding. -Microsoft for the application "Visual Studio"
Last edited by StrykerDE on Mon Apr 22, 2019 7:07 pm, edited 13 times in total. And i will not change my mods to adapt it to your loader, it is created for players, with easy install, uninstall function. It is use own folder in package, it is work well exact from that place! So if you want - made adaptation of mods by own hands. Good luck! Nasipal wrote: Hello, good work. But, my mods is already have Clean(original files not touched), easy installation and uninstalaltion function, also i found how to use additional file, long time ago, and it is used by first client mod pack from start: it is change only one mft file and add new one modded file what apply changes/mods to each level, and if you delete that file mod will be uninstalled. Thanks, yes I know, I found out about package.mft because of your mods. Nasipal wrote: (Dont know why you made no vietnam philter - by changing default common file - maybe before you start made own mods - try to look how exist work first or ask). Any way logic of using one more extra file was subscribed in one of my post here. Same can be done for server. I did know about package.mft when I started modding, but for such a small mod I did not want to modify the package.mft because it would have made my mods incompatible with every other mod which modifies package.mft like your "client mod pack". Therefore I created this tool which modifies the package.mft only one time and then places all mods (Client Mod Pack, No Vietnam Filter etc.) into an extra fbrb archive to avoid these compatibility issues. One of my biggest let down was, that I could not use all mods together which are modifying package.mft, my tool provides an easy fix for it. Both mods would normally be compatible, but they are not because both mods are modifying package.mft. To avoid this I created BFBC2 Mod Loader. If both mods would include a package.mft, one mod would simply overwrite the other mod and you would only have the changes of the mod that was installed last. I did not include your mods in my BFBC2 Mod Loader (The tool includes NO mods at all, it's just the tool) so I thought I don't need to ask you. I just included a link to your mod in my description as a recommendation, but if you don't want this I will remove the link from the description of course! Feel free to help me, also other people should feel free to help me by providing bug reports, suggestions etc. Nasipal wrote: And i will not change my mods to adapt it to your loader, it is created for players, with easy install, uninstall function. It is use own folder in package, it is work well exact from that place! So if you want - made adaptation of mods by own hands. Good luck! It's completely ok if you don't want to make your mods compatible. Mod users can also make your mods compatible themselves. Every modder should feel free to use my tool or not. I don't force anyone to use my tool! Don't stress yourself, you don't need to include Mod Loader support if you don't want to. Thanks for your offer to help me, if I have a question about modding I will ask here of course. Please don't hesitate to make things clear if I misunderstood something. Note: Make sure to also download the latest version of my mods, older versions are not compatible anymore!